Intel’s new premium processors prompt a motherboard makeover. No matter how you feel about 2017, it’s been a great year for CPU releases. Intel and AMD have doubled down on core counts, prodding processor speeds to new heights and producing some of the slickest silicon since Sandy Bridge. Motherboards have been a different matter, however. Intel’s sweet Z270 chipset and its silky-smooth setup turned out to be the exception rather than the rule. AMD had plenty of teething problems with Ryzen and Threadripper, and Intel’s X299 introduction supporting Skylake-X was beset by testing board recalls, rushed BIOS updates, memory issues, and other bleeding edge problems across a range of manufacturers that took months of work to overcome. The rapid competitive pace may be bringing long awaited tech to the marketplace sooner, but there’s been a price paid in stability and patience. Practically speaking, this means waiting a few months before building the latest and greatest system is the wise move. Unless you like playing beta tester, let the firmware updates catch up with the bugs, and wait for happy owner reports to be the rule, rather than the exception. Anticipation beats an early-adopter ulcer. The good news is that X299’s awkward introductory phase is officially over and there are plenty of motherboards to choose from for HEDT enthusiasts. All the products evaluated for the guide now feature mature, well-sorted firmware and broad memory support, a big step up from the situation during the summer. A few are even second-generation redesigns. Since the HEDT platform is known for Pentagon-level pricing, special care has been taken to offer reasonably priced picks for the midrange and entry level, along with some alternatives for rig builders with deeper pockets. ASUS’s leadership at the high end has been besieged on all sides by hungry competitors like Gigabyte and MSI, so it’s welcome to see they’ve upped their game recently with the Rampage Extreme VI. The latest version of ROG’s top motherboard doesn’t rely on the circus atmosphere previous editions used to push excitement, instead presenting a confident, futuristic design sure to turn rig builder’s heads. The style here is subtle, with silver and black brushed metal heat sinks that house AURA lighting RGB LEDs, which can be configured for a variety of pulse and trace effects or turned off completely. ASUS’s goal of streamlining the Rampage sees components bundled previously as add-in extras incorporated directly into the motherboard with some impressive results. Previous variants of the Rampage included goodies like overclocking display modules or high-speed Aquantia network cards in the box, both of which are now part of the standard onboard compliment of features, no slots or drive bays required. Networking is especially well represented, with every conceivable wired and wireless network standard present and accounted for, from 3T3R 802.11AD WiFi to 10 Gigabit Ethernet, backed by top-shelf integrated hardware from Intel and Qualcomm. Few home networks today can keep up. M.2 support jumps to three 4-lane sockets, including a unique adaptor that converts unused DIMM slots into an M.2 drive connector using the CPU’s I/O lanes for improved performance. Slot design allows for full-speed x16 four-way SLI, a rare capability of note to the cryptocurrency crowd and other multi-GPU aficionados. This M.2 adaptor sits in a slot just to the side of the right DDR4 bank. Intel’s VROC RAID is supported. ASUS’s newfound focus also pays off with the best overclocking experience for X299, taking the lab’s 7900X to a stable 4.8 GHz with careful tuning. VRM temps were noticeably cooler than the others, although MSI’s X299 XPower Gaming AC wasn’t bad in this regard either. The Extreme VI also had no problems working with every stick of DDR4 it came across sans hiccups or major adjustments, including a few gentle memory overclocking tests. Given everyone’s early firmware issues with X299, this felt miraculous. Incidentally, wattage numbers at these clocks and core counts are insane, so if you plan on overclocking be sure to back up your build with a beefy, well-made power supply in the 1000-watt or better class. Skylake-X’s crazy resource requirements can make the best PSUs sweat, and the difference between a smooth build experience and frustration can come down to feeding it plenty of clean, stable power. Even well-made 750-watt power supplies won’t cut it, especially paired with exotic graphics card configurations. The screen disappears behind the mirrored surface when not in use. The most visible boutique feature is the OLED system display built into the I/O shroud that provides clockspeed, error codes, and temperature information. The display is also customizable, and supports short GIF-style animations and logos. The board is clad with a selectively transparent metallic plating that appears solid but allows lighting effects and the OLED display to shine through when activated. The combination looks fantastic, especially paired with a tempered glass case like Corsair’s 570X. ASUS earns every penny with exotic features and unique looks. Surprisingly, while the board’s in-box presentation was good, the more mundane task of finding drivers and setting up the software was troublesome. Corrupted downloads, scattered file listings, installation issues, and sparse instructions make initial setup stressful for newcomers. Combine that with a BIOS that’s easy to get lost in, and it’s a simple matter for first timers to get in over their head. If you're new to the HEDT arena, you might want to stick with a slightly more mundane setup. MSI sailed to an easy midrange victory with the X299 Gaming Pro Carbon AC, a utility infielder that offers every feature you’d expect along with impressive performance and style at a reasonable price, a rarity for the HEDT platform. For the many enthusiasts asking for toned-down styling options, including gamers, MSI has delivered a restrained overall appearance, although the tunable Mystic Light LEDs stand ready if you want to party. MSI’s X299 Carbon Pro AC can dress for any occasion. Clad in grey and black, the Carbon Pro can also change up its appearance sans light show, via alternate heatsink snap-in plates that come in the box or can also be 3D printed in any style or color, with logos or without. This is a nice touch, and makes MSI’s board one of the most flexible when it comes to rig customization. The standard mounting points for 3D-printed accessories are also present, providing the full DIY experience for system builders with big imaginations. Performance is strong, with the X299 Carbon Pro AC providing a solid overclocking experience topping off at 4.6 GHz before things start getting too toasty, just a few ticks short of the sample 7900X’s full potential. Memory support with current BIOS revisions is also good, running the lab’s G.SKILL and Corsair memory in dual and quad configurations at speeds up to 3600, although the latter required a few tweaks for full stability. Dual four-lane M.2 slots and a U.2 connector deliver high-speed drive access along with eight SATA 6Gbps ports for more traditional storage media. Intel’s v219 Ethernet and AC-8265 WiFi handle networking with typical aplomb, and the rear panel offers four Gen1 USB 3.1 ports and a pair of Gen2 ports, including one with a Type-C connector. Supplementing the chipset are a mix of ASMedia’s ASM3142 controllers and ASM1074 hub, which provide the USB 3.1 Gen2 support. While the price is more than fair for the stability and features on tap, the exotic feel that’s traditionally been part of the HEDT experience is lacking here. It starts with ephemera like cheaper packaging and fewer box goodies, but it doesn’t take long to realize that more useful extras are also absent, such as dual or 10G Ethernet controllers, 3T3R or 801.11AD WiFi, a third M.2 slot or bundled expansion cards. These features aren’t required for most people, but it’s nice to have options. 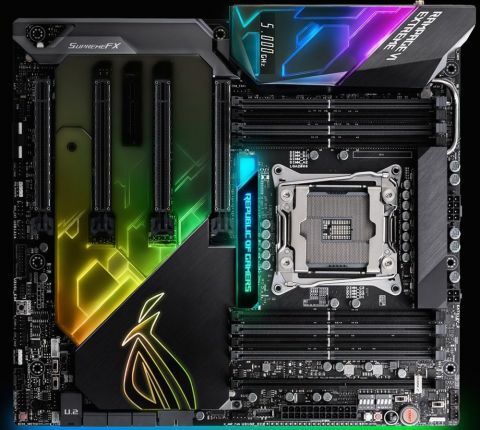 ASUS’s X299 Prime Deluxe is a good step up for rig builders looking for a little more; just be sure you really want those extra features since the price jump is significant. 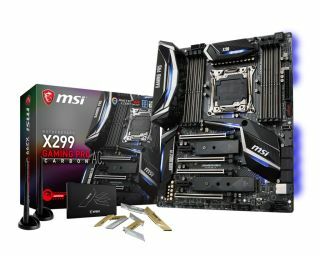 After an absence in the budget segment of the motherboard guide since the days of Haswell, ASUS’s Prime X299-A snatches the entry level crown from the MSI’s Tomahawk series with a combination of style, refinement, and BIOS features that make it the de facto choice for X299 enthusiasts looking for a baseline motherboard or budget build. Overclocking tests with Skylake X defied expectations and produced processor speeds of 4.6GHz, equaling some midrange competition. Memory stability was also good, although it’s best to stay at or below 3200 and use qualified DDR4 if stable long-term CPU overclocks are the goal. Also make sure to provide plenty of air circulation as the VRMs get hot. Looks are a strong point for the Prime, with the white and silver scheme used since Z170 aging particularly gracefully here. A modest Aura implementation provides LED excitement for those looking for flash, and the diagonal, brushed metal heatsink designs are attractive without being garish. Color coordinators should take note that subtle touches of pale green are used on the shroud and chipset shield. These accents look fine on their own, but may clash with certain components, so plan appropriately. Intel’s v219 Ethernet covers LAN duties and USB includes four version 3.1, Gen1 ports and two Gen2 ports, one with a Type-C connector. The back panel features a BIOS flashback button, and the board itself has a memory reset switch. WiFi however is absent. Audio starts with the Realtek ALC1220A codec and is backed with ASUS’s Crystal Audio enhancements, once again putting it on par with more expensive boards here on paper, although during testing the midrange and high-end boards tended to produce a slightly richer and cleaner sound. Nevertheless, audio was crisp and drivers were well behaved, you’d need a good set of headphones to notice the difference. This generic aspect of the Prime X299-A is also its biggest liability. While the rest of the hardware recommended here tries to engage the user in some way or otherwise set itself apart, the Prime X299-A is happy to be the company man. For some, this uniformity provides a stable platform building experience while for others it’s the boring choice. There’s a case to be made for drama-free hardware, however, especially when shopping on a budget. Note that MSI already has an answer to the Prime in the form of the updated X299 Tomahawk AC. This board arrived at the lab too late for inclusion in this feature, but with WiFi, a lower price, and more personality, this newcomer is already challenging the Prime for entry-level supremacy. Intel’s previous X99 HEDT chipset is well loved by enthusiasts, and the first to really gain traction as more than an exotic sideshow. Partially due to X99’s long desktop shelf life, where three generations of compatible processors saw time in socket 2011v3 motherboards, the platform was a stable and rewarding investment. Even now Jarred’s benchmarks show some surprising wins for the aging 5930K, and that’s not even factoring in the great overclocking headroom processors like Haswell-E provided. CPU design is going wide rather than long these days, with cores multiplying faster than clockspeed advances, and results are mixed. While all those extra threads keep a system smooth and facilitate multitasking, designs with lots of cores tend to have lower IPC for several reasons. On X299, one of those reasons is Intel, who prefers utilizing mature, stable technology in the IT-oriented business markets from which the HEDT system architecture is derived. Well-developed previous-generation core designs are used and beefed up with cache and system memory advances, along with other perks. While these compensate somewhat, nothing improves IPC better than the one-two punch of higher clockspeeds and improved core designs. As a result, IPC is always paradoxically higher in Intel’s consumer-market offerings, Coffee Lake being the latest example, since they offer the newest cores at the fastest speeds. It’s also harder to produce high clockspeed processors with many cores at the foundry level, since the chances of a low-performance core sneaking in and dragging the CPU to a lower bin go up dramatically as the core count rises. Intel recommends AIO watercooling at a minimum for X299 systems. Intel employs several strategies to minimize these problems, including new advanced turbo modes that favor multiple cores and the introduction of a hybrid CPU, Kaby Lake-X, which takes an overclockable late model core, disables the integrated GPU, and puts it on an LGA2066 package, creating a clockspeed happy, high IPC, low core variant for those looking to mix the HEDT experience with today’s CPU technology. Not all X299 boards support these processors, however, and their low I/O lane counts and lower total memory limits their appeal to the big iron customers common in this segment. Still, Kaby Lake-X remains an easy path to X299, lowering the entry price to the no-limits HEDT platform while also providing a comparable gaming experience to the fastest processors available in the standard consumer market. The fact that most push 5GHz without trying hard also puts them ahead of the 7700k for many enthusiasts, especially overclocking hobbyists. The motherboards recommended in this guide all received various forms of hands-on evaluation including enclosure installation (full tower, mid-tower, and test bench where applicable), performance benchmarking, stability testing, and a follow-up period of real-world break-in usage that focuses on gaming, entertainment, and media software. When possible, all tests are performed with the same components installed to remove any variables except the motherboard itself. 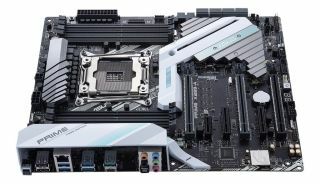 We also researched the entire field of gaming motherboards and narrowed the list down to the best, most competitive boards before choosing which boards to test. Benchmarks include AIDA 64 Extreme, Cinebench 15, Crystal Disk Mark, FireStrike, PCMark 8, DPC Latency Checker, and others with all relevant results reflected directly in the review sections for each board. The real-world break-in period encompasses office and creative work, media streaming, and gaming with a variety of demanding titles such as GTAV, Total War: Attila, Warhammer 2, Company of Heroes 2, DiRT Rally, Bioshock Infinite, Metro: Last Light, Rise of the Tomb Raider, Far Cry Primal, Hitman, and others. Gaming tests are run at 1080p at medium to high settings to remove any bottlenecks caused by graphics card performance. Rather than outright speed, scores are reviewed for outliers that indicate stability or driver issues. When possible, both single- and dual-graphics card configurations are tested to insure motherboard stability in SLI and Crossfire situations, at high refresh rates, and using 4K resolutions. High-resolution tests are performed on LG’s OLED C7 for clarity purposes. Overclocking benchmarks include a uniform CPU multiplier test at a fixed Vcore voltage (1.2V) as well as auto overclocking software (where applicable) and fully tuned manual overclock results. Stability tests are performed with AIDA64’s stress utility and extended runs of the gaming software suite at varying levels of detail.